The purpose of a schoolhouse is to have one place where people can share knowledge and information in hopes of creating wisdom. Let's "go back to school" and explore some of the rooms used for this common purpose — including the schoolhouse that many people consider the oldest wood school in the U.S.A.
You don't need a school to get an education, so why are there so many schoolhouses around the world? One reason is that a school is a building where people congregate to do the same thing. In this sense, a classroom is sort of like a bathroom — the people who go there have a common purpose. The classroom shown here in Bali, Indonesia has no windows and no doors.The circular, one-room schoolhouse opened in September 2008 with the singular mission of creating a community of learners who can become "green leaders." Educating for sustainability, and carrying on sustainable development in our fractured world, the Green School brings together like-minded people to achieve a common goal. This is what the one-room schoolhouse has always been about. The classroom shown here is a temporary school built in China. In 2008, an earthquake in Sichuan Province destroyed many buildings, including schools, in a heavily-populated region of China. Destruction was so vast that the people knew it would take years and years to rebuild everything. The local education bureau asked Japanese architect Shigeru Ban to help them construct temporary schoolhouses. Ban had an idea that strong schoolhouses could be built quickly by using big, heavy paper tubes. Look closely, and you can see that the rafters in the class are really industrial-strength paper tubes. In about 40 days, Shigeru Ban showed 120 volunteers how to put together paper tubes to build Hualin Temporary Elementary School. The schoolhouse was one of the first buildings constructed by the settlers of the United States. And if the oldest town in the US is up for debate, so is the oldest schoolhouse. St. Augustine, Florida wants to be the oldest of all. Most of the original wood construction from Colonial times has gone up in smoke. Fires devastated many historic buildings throughout America, including most of Chicago in the Great Fire of 1871 — remember the story about Mrs. O'Leary's Cow? The Great Fire of June 6, 1889 destroyed most of the original settlement architecture of Seattle, Washington. Every urban area has had its problems with fire. Poor St. Augustine must have had its share of fires, too. None of the original wooden structures remain, except one. The schoolhouse in St. Augustine is thought to have survived since the early 18th century — its pest-resistant red cedar and cypress timbers, put together with wooden pegs and handmade nails, have outlasted the construction of its neighbors. Drinking water was drawn from a well, and a privy was dug away from the main building. To protect the house from heat and fire dangers, the kitchen was located in separate quarters, detached from the main building. Perhaps that is what has saved the building. Perhaps it's just lucky. No one knows for sure whether or not the St. Augustine structure is the oldest wooden schoolhouse. New Mexico and other parts of the American West claim to have schools much older. Nevertheless, the St. Augustine Schoolhouse offers some insights into how North American buildings were constructed back in the 1700s. At first glance, this ramshackle building near St. Augustine's historic city gates may look like a movie set. Surely no house could be that weathered and still stand! But records suggest that the tiny house may be the oldest surviving wooden school building in the United States. The house must have been constructed before it first appeared on the local 1716 tax rolls. And a Spanish map from 1788 noted that the building was only "in fair condition." Yet it still stood. It's thought that the Saint Augustine Schoolhouse was originally a small homestead belonging to Juan Genoply. After Genoply married, he added on and eventually the house became a school. The schoolmaster lived upstairs with his family and used the first floor as a classroom. Boys and girls shared the same classroom, making the St. Augustine school one of the first in the young nation to go "co-ed," although it likely was not racially integrated. Today, the schoolhouse resembles a theme park attraction. Mechanized figures dressed in 18th century attire greet visitors and describe a typical school day. Children can receive make-believe diplomas. But America's "oldest wooden schoolhouse" is not all fun and games. The building has seen very little changes in the past three hundred years. By examining its construction, you can see how buildings were made in America's colonies. Although it might have an architectural style similar to the log cabins found in America's frontier, this St. Augustine landmark has a facade of rough hewn timber. The style is more Colonial New England than Spanish Colonial typically found on the east coast of Florida. If you look closely, you may notice an enormous anchor secured to the house with a long chain. These are not a part of the original construction. Worried that a hurricane might whisk the little schoolhouse away, townspeople added the anchor in 1937. Today, a garden with hibiscus, bird-of-paradise, and other tropical plants offer fragrant aromas and soothing shade to the visiting tourists. As part of St. Augustine's history, the Colonial building has also become part of the city's economy. The St. Augustine schoolhouse is thought to be the oldest wooden school in the United States. Or it might be a simple tourist trap. 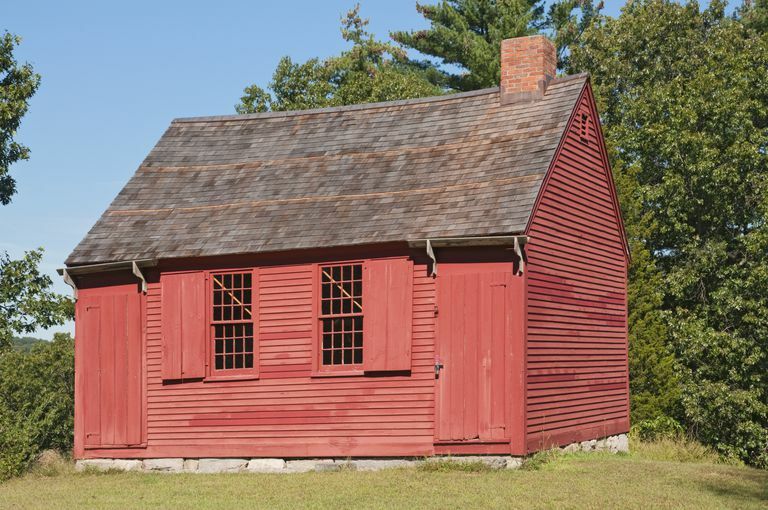 Every year hundreds of children visit the Redstone School, a little red one-room schoolhouse in Sudbury, Massachusetts. Also known as Mary's Little Lamb Schoolhouse, it's said to be the site for the lamb that followed Mary to school one day in that famous nursery rhyme. However, it's been moved from Sterling, MA and rebuilt from wood that may or may not have been in the original structure. It is a tourist attraction painted red. Then there's the Ichabod Crane Schoolhouse in Kinderhook, New York. It, too, is a tourist destination said to be the workplace of the schoolmaster in Washington Irving's fictional story The Legend of Sleepy Hollow. Its architecture is similar to the St. Augustine wooden schoolhouse and Mary's Little Lamb Schoolhouse, except it's painted white. And then there are the hundreds of abandoned schoolhouses, made of wood, stone, or adobe, like the one shown here in Las Animas County, Colorado. Should we allow these obsolete structures to deteriorate, or should we keep them alive by turning them into picnic areas for tourists? Schoolhouses around the world are by their very nature historic structures. They trace a community's values, culture, and history. They house memories of common experiences through time. They are part of all of our lives.